Many people are afraid to leave their home because of crime. Some believe that more action should be taken to prevent crime. While others feel that little action can be done to stop crime. What is your view? It is irrefutable that crime is burgeoning day by day in many countries. Many people are scared to go It is irrefutable that crime is burgeoning day by day in many countries. Many people are scared to go away from their home because of crime. Some people contend that number of ways can be used to prevent crime. While other people argue that nothing can be done to prevent it. I believe that it is possible to tackle this serious issue by taking some action. Firstly, some people do not want to leave their home because they think that they are secure only in their homes. They feel that if they go out of their home then they may be affected by crime like chain snatching, murder, kidnapping etc. One approach would be to increase the number of police on roads. If more police were on the streets, whether on foot or on patrol cars, criminals would be less likely to commit crime and people would feel much safer. Having more police especially at night would be particularly beneficial. A second possibility would be to make laws stricter and punishments more severe. This could involve increasing fines or lengthening prison sentences. If a criminal has to pay more money for doing something illegal or would have to face more time in prison then I believe this is likely to reduce the crime rate. On the other hand, some people are frightened to leave their home because they feel that if they are not present in their home then their home is not safe from crime. To solve this problem, methods to increase security might deter potential criminals. For example, more effective alarm devices can be used in houses. Technology is so advanced nowadays that the alarm could ring on your mobile device if someone breaks-in your home. This would reduce burglary and theft. In addition, hidden security cameras like surveillance cameras can be used in homes with the help of which people can watch what is happening in their homes from anywhere. In this way one can feel secure about one’s home. 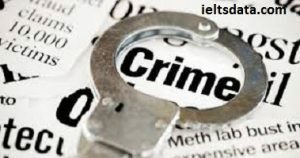 In conclusion, although crime is a major problem in most cities in the world, the situation can be addressed by adopting the methods mentioned above. It would definitely be wrong to say that nothing can be done to address this problem.